As ketchup is to Americans, as soy sauce is to Chinese, the favorite condiment in ancient Rome was garum, an anchovy sauce. As strange as “anchovy juice” may sound, colatura is an aromatic condiment that enhances any dish, adding flavor without fuss. Ask any great Italian chef, and you’ll probably find that colatura is their secret ingredient (it’s an umami food). Chef Lidia Bastianich told the Wall Street Journal just that. She uses a touch of colatura instead of salt. Colatura (the word comes from the Latin colare, to strain) is made by curing anchovies with salt and extracting the free-run liquid that drains from them. It’s a laborious and painstaking process to create a truly artisan food. The clear amber liquid is as highly prized by Italian cooks today as it was back in ancient Roman times. Back then, dinner guests would bring a bottle of colatura as a house gift, as one would bring a bottle of wine today. In fact, prior to the 20th century, Italian families would make their own colatura for home use and for gifts. Today, they can use this time for other pursuits thanks to Cetara, a small fishing village on Italy’s Amalfi Coast. The town produces colatura as an heirloom food. Is colatura a great secret waiting to be discovered? We think so. Even if you’re not an anchovy fan, colatura is a wonderful blending ingredient, adding a briny, zesty flavor that isn’t fishy. Unlike anchovy paste and Southeast Asian fish sauces such as nam pla and nuoc mam,* the flavor is briny (so use less salt in the recipe). Pick up a bottle of colatura di alici online for yourself or your favorite cook. 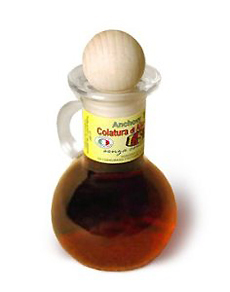 *Colatura is the free-run juice of salted anchovies, a richer product than most southeast Asian fish sauces. The latter is brine in which fish (or fish parts) have been pickled. Create a sauce for pasta (a favorite use in Italy): Combine 3:1 olive oil and colatura, sautéed garlic, lemon zest or red pepper flakes and parsley. Add a spoonful to perk up the flavor in soups and sauces. Add a teaspoon to sautéed greens (escarole, spinach, Swiss chard) or potatoes, with some crushed or minced garlic and a dash of chile flakes. Make a simple salsa verde: Blend colatura with lemon juice, fresh herbs and garlic for fish dishes, as a salad dressing or as a dipping sauce. Add a splash to Caesar salad dressing or other salad dressings. Mix with the pan juices of grilled fish to create a sauce. As a drizzle on sliced tomatoes, instead of salt. Add to mashed potatoes (mash the potatoes with extra virgin olive oil and season with colatura and chopped flat-leaf parsley) or hot potato salad (sliced potatoes dressed the same way). From Lidia Bastianich: Drizzle on roast lamb or chicken before serving; distribute with a brush. Tell us your favorite uses!